One of the most influential players of them all. Break out that thumb pick and be warned – if you want to make it sound easy (hint: you should) you’ll have to work hard. Don McLean’s beautiful song given a fantastic arrangement by Chet. And here he is playing it – this is the performance from which I made the transcription. 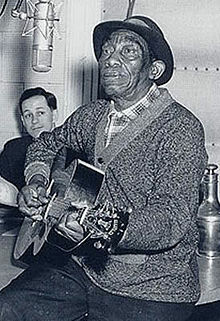 Mississippi John Hurt’s style was both individual and influential. Candy Man Blues is one of his best known songs – the deceptively lilting melody and accompaniment are a clever distraction from some outrageously suggestive lyrics! The song’s syncopated rhythm is distinctive and may take some work to master, but it’s well worth the effort. Ralph McTell is best known for Streets Of London – it’s practically become a hymn. But far from being a one-song phenomenon he’s also a great country blues and ragtime guitarist with a big influence. Here is a note-for-note transcription of Blind Blake’s Rag, originally released on his first album, Eight Frames A Second. You’ll need to maintain a steady rhythm with the thumb – and be careful to keep it going as you do the second string bends that give such a cool inflection to this arrangement. The Chet Atkins transcription of Vincent is excellent. The musicianship of Atkins blew me away.